After 35 years in Parliament, it has been a really invigorating process to work with our Council, and its Officers after some pretty lame experiences with local government in the past. It has, however, been very rewarding to work in partnership with the LEP and with Sussex University and other ambitious institutions, not least in the delivery of our really very significant project of the Science Park, which will attract Global attention. So, what absolutely sets our Council apart, and what is very well reflected in their Economic Development Strategy, is the scale of their achievable ambitions and their “can do” attitude – something I am afraid that is gravely lacking elsewhere. It has been a particular pleasure to welcome recently to Mid Sussex the Secretary of State for Business, Energy and Industrial Strategy, the Secretary of State for Transport and the Secretary of State for Digital, Culture, Media & Sport in the last few months, to see what we are doing here, and to openly support the work that is being vigorously carried forward in our already very successful local economy. We have had further meetings with the Leader of the Council and our excellent Chief Executive, with the Secretary of State for Housing, Communities and Local Government and the Minister of State for Education at Westminster which have yielded significant results. There is no doubt that what is going on here is of profound interest and importance to the delivery of Government policy, and commands the Government’s attention in our area of near full employment, in which it is making some very substantial and important investments. 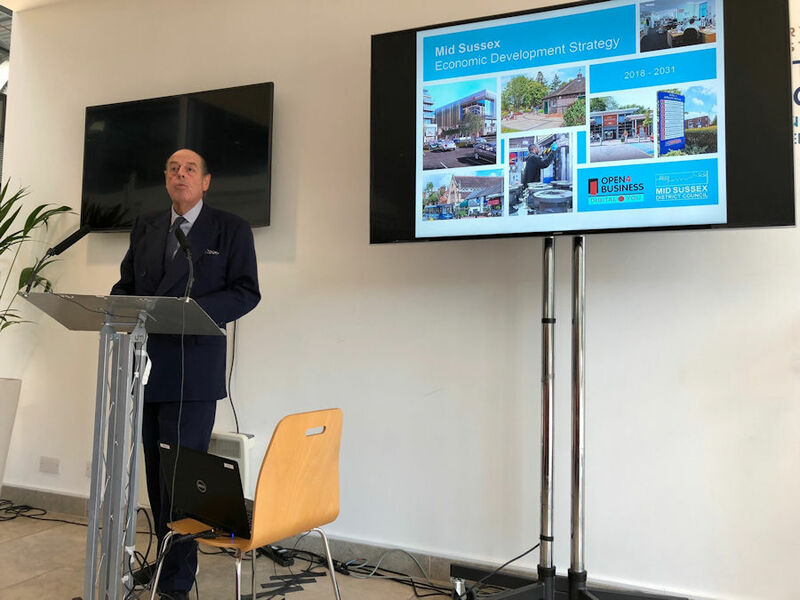 In short, the message that I want to convey is that Mid Sussex is very much open for business; it is determined to show that its policies and its people are committed to facilitating growth, and that there are very substantial opportunities to be had here for local businesses and enterprise. On the more general point of the Government’s commitment I would like to say this. We here, like the Government, want to ensure that our local economy is dynamic, modern, open, increasingly digital yet secure and resilient. We want to show our support and help for businesses that are creating the products, services and opportunities that underpin modern trade and that are not afraid of the disruption which is inevitably going to follow the unstoppable process of AI. The Council is determined that it must for the future be agile and entirely transparent in its desire to promote opportunity. There are inevitably some clouds on the horizon. In particular, our education standards in West Sussex are frankly not nearly good enough in some schools. We have some outstanding schools, but we also have others that are coasting at all levels, and the West Sussex Members of Parliament are currently in discussion with the Government, with the Schools Commissioner and Ministers at the Department for Education, as to how we can secure significant improvements. This is very important for our area for the future. We are working extremely hard to resurrect our Sixth Form College in Haywards Heath, and I want to congratulate the District Council and the LEP on their detailed work in support of this effort. This will be a vital resource for local businesses, who we look to, to support this endeavour, as we seek to provide the young people with the skills necessary to work in the increasingly demanding world of commerce and enterprise, and to sustain the employment which will arise as our local economy grows even faster particularly with the coming of our Science Park. We are truly fortunate in this part of the world in the quality and diversity of our businesses, our industry and our local commerce. These combine culturally and economically together with the whole environment of Mid Sussex, to provide a truly unique platform for a civilised and prosperous community, to further grow our outstanding local economy. The world is going through profound change. Britain’s success in the past was always based on our ability to adapt. Here in Mid Sussex we start from a position of strength, but the great revolution of Artificial Intelligence and Digital means that we are going to have to adapt again for the future. We are investing here in our future – in our children’s education and in the urgent need to improve Skills and in our physical infrastructure. We are creating space for businesses to thrive and for our people to uncover and develop new and fulfilling opportunities and careers locally. Change for all of us is not optional, and business and local government will need to be very agile in meeting these challenges particularly as we leave the European Union. My aim is to see to it that my Constituency can offer the talent, the ambition and the excellence that will drive growth locally to the benefit of all in our community. We are all of us, in whatever world we make our way, living in a world that is volatile, uncertain, complex and ambiguous. We need, all of us, to show that in Government and Business, we have the vision, understanding and adaptability to drive these terrific opportunities for Mid Sussex.